Special FX artists that are professionally trained are in high-demand. Special FX makeup is needed in many different areas of the industry. It’s used in film, TV, theater, photo shoots, and commercials. It’s also used for special events, and holidays. You’ll be able to add some impressive skills to your resume at the end of this class. Rachel Levine has been creating gory and gruesome looks for the past 10 years. Learn some fun skills to creep out your friends and family. 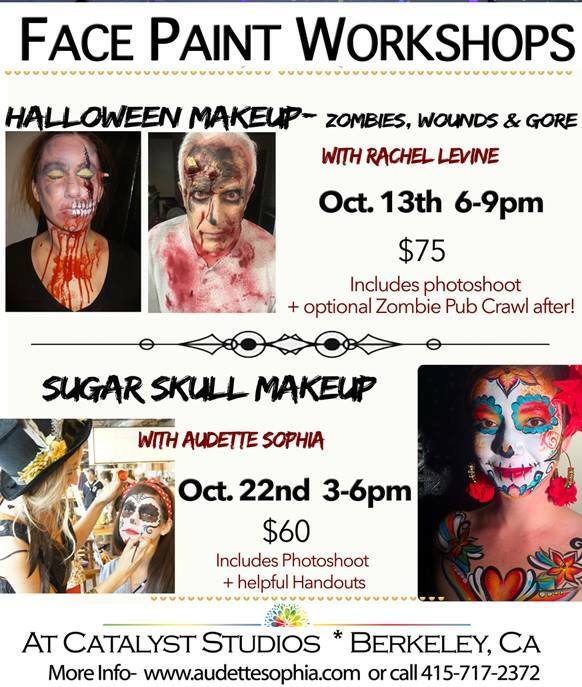 HALLOWEEN MAKEUP DESCRIPTION- Learn to create hideously gruesome open wounds and infections that will last throughout the night in this fun and festive 3-hour long workshop. Learn how latex and cotton or tissue, and fake blood can bring your zombie to the next level. We will learn basic techniques to create our own unique zombie with a backstory . You can create burns, bruises, cuts, undead translucent skin, with sunken eyes and decay all with easy to find tools and a basic professional kit. When you enroll we will send a list of suggested supplies… but we will provide supplies for purposes of the class.